Today was my first chance in quite a while to play and study some of the course designs created by H.B. Clark. A world-renowned course designer who has designed a number of courses in Kentucky and Tennessee. My first stop on the day was at Airport Park in Clarksville, Tennessee. One of H.B.’s designs from 2010. I thought it was quite a shame while playing the course, as it isn’t being maintained very well. So I am sure that your average player who plays that design gives it a low rating. Due to maintenance, rather than H.B.’s vision for the property. View from the Hole 4 tee at Calvert City Old Park DGC in Calvert City, Kentucky. After finishing up at Airport Park, soaked in cold water from my feet up to my knees, I was able to play two additional H.B. designs. The first at Old Park in Calvert City, Kentucky. The second at Doctor’s Park DGC, also in Calvert City. Two nine-holers that I thought were a lot of fun to play! Old Park was shorter, weighing in at 2,500 feet over nine holes. But Doctor’s Park had a bit more teeth to it…measuring 3,145 feet over nine holes. View from the Hole 6 tee at Doctor’s Park DGC in Calvert City, Kentucky. Hole 6 at Doctor’s Park gave me a laugh, as I had an older couple shout: “Did you mean to do that?” after I put my approach shot under a big branch and through 3-4 trees on its way to landing about ten feet left of the basket from around 240 feet away. I said, “Yes, I meant to do that.” And then they both said: “Well then, you must be pretty good!” Ha! It’s always nice to have other people see and appreciate some good shots, as so many of my rounds are played when I am literally the only person on an entire course! I can shout and pump my fist into the air, and not a single person would know I am there. 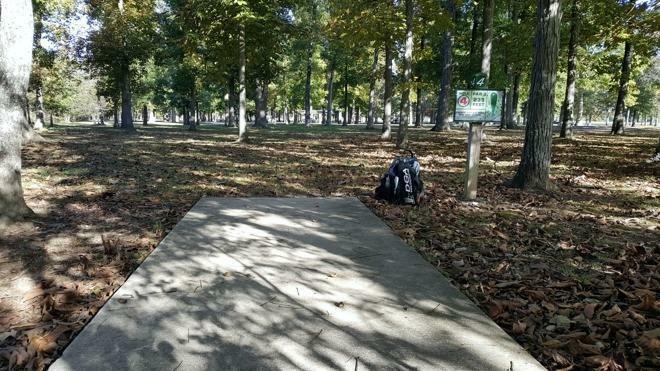 After Doctor’s Park, I drove up to Marion, Illinois to check out Pharoah’s Way DGC, an eighteen-hole course that I had not yet had the opportunity to play. A neighbor’s barking, very aggressive dog ruined my mood in the middle of the round, but I quickly got my head back in a good place and managed to post a -7 (47) on the 4,562 foot course. It sounds easier than it actually was…as there were several holes where OB, water, and rough to avoid came into play. And with me needing to cover hundreds of miles on the day? Let’s just say that if a hole looked as though I could lose discs and/or waste a LOT of time searching for my drives? I would usually lay-up and throw a safety. View from the Hole 4 tee at Paul A. Schroeder Park in Manchester, Missouri. After Pharoah’s Way, I played a quick nine holes at Veteran’s Memorial Park in Mt. Vernon, Illinois, then made my way over to the West side of St. Louis, Missouri to catch a quick nine holes at Paul A. Schroeder Park in Manchester. I enjoyed that course, though I ran out of daylight to try and get one additional new course played in Iowa. It would have been a chance to say that I had played disc golf courses in five different States in a single day! Oh well, I needed to settle for six courses played across Tennessee, Kentucky, Illinois and Missouri. I’ll knock a few more courses out in Iowa tomorrow, as I make my final push for home.